Having undergone multiple Talent reworks since his release, Malfurion once again finds himself in Blizzard’s good graces. 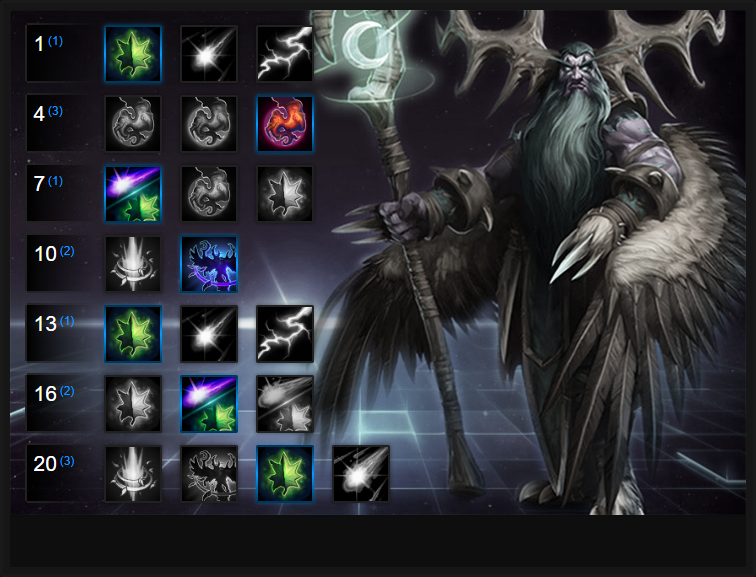 Having undergone a full Talent rework, I’ll happily argue that he’s much better for it. While he has lost some immediate burst healing as a result of Regrowth now only providing a heal over time (really, it should be called Rejuvenate), he makes up for this with greater healing over time. What’s particularly interesting about Malfurion is that he can maintain Regrowth across 4 Heroes with relative ease, while poking with Moonfire offers an immediate high burst of healing to any allies under its effect. This not only offers him massive sustain, but also the opportunity to keep his team and their health topped up. Combined with his Innervate, Malfurion is exceptional at winning long drawn out fights and while he does struggle against teams that can dive and deal massive burst damage, especially against the likes of Li Ming or Kael’thas. Despite that, his healing over time is more than enough to neutralize the threat of many Heroes, notably the likes of Nazeebo, Lunara and Blaze. Finally, purely for his AOE silence Malfurion will always have a place in the competitive scene. His ability to shut down dive, when it’s available, ensures he can tilt a fight in his team’s favor near instantly. Innervate (Trait) - Through Innervate, Malfurion is the only Hero that can restore mana to others, and you should be taking advantage of this as often as possible. While you ideally would like to be using Innervate on your most mana-hungry allies, don’t hold on to it for long periods of time just to use it on the best target. You should be keep Innervate more or less on cooldown; just keep in mind it cannot be self-cast. What's also particularly strong about Innervate, besides the mana sustain it provides, is that it also lowers a targets cooldowns by 50% for 5 seconds. On high cooldown Heroes such as Jaina, it's invaluable. Regrowth (Q) - In terms of total numbers, no other basic ability offers the level of single-target healing over that Regrowth grants. This is balanced by the fact that all the healing is done over time, which makes this ineffective against large burst damage. Because of this, it’s important to anticipate where the damage will be coming from, so you’re beginning to heal your allies right away, rather than waiting until it’s too late. Do remember that as Regrowth has only a 5 second cooldown, with a 20 second duration, you can comfortably maintain it on 4 of your team, so be sure to use it liberally. Its low mana cost ensures you can constantly cast it with relative ease. Moonfire (W) - The damage on Moonfire isn't impressive; however, due to its extremely low mana cost and cooldown, it can be used often as an effective poking tool, or even finishing off a kill on a fleeing enemy. Moonfire is also useful for revealing stealthed enemies, taking down merc camps, and checking brushes due to the vision it grants. If there's a Nova or Zeratul on the opposing team, you should be constantly using this skill to reveal them. What's also incredibly strong about Moonfire is the fact it provides burst healing to anyone on your team who is affected by your Regrowth with the burst healing based on the number of Heroes you hit with it. Ideally, try to always Moonfire opponents when Regrowth is active to keep health on your team high. Entangling Roots (E) - Entangling Roots has a small AoE on the initial cast, though its radius will grow over 3 seconds, rooting anyone who gets caught by it. You will instantly root anyone who’s standing in the area of the initial cast, though this can be difficult to do against opponents who are looking out for it. The need to aim well often makes Entangling Roots more effective as a follow-up to reliable CC, although it can also be used as a tool for zone control, or guaranteed CC against a stationary enemy. If possible, try to always use it in areas where players will try to escape to such as a doorway to prevent their escape. Tranquility (R) - Tranqulity offers lengthy healing over time, and can change the tide of a team fight as your opponents struggle to finish off your allies. The beauty of this ability is that despite being an over time effect, Malfurion is still free to move around and cast other abilities (though he cannot mount up or Hearthstone.) Tranquility is at its best when it’s healing multiple allies who are affected by your Regrowth (for double the healing, and an armor bonus), so try to position yourself to get the most use out of this Heroic, especially considering its cooldown. Twilight Dream (R) - For a Support Hero, Malfurion can put out reasonable damage if he wants to and is helped, largely, by Twilight Dream. Aside from the surprisingly high damage numbers, Twilight Dream’s real usefulness is in the form of its silence. Stopping enemy abilities for a full 3 seconds can be incredibly powerful, but it can be difficult to position yourself in a way that will cause this ability to hit the maximum number of targets. Because of this, Twilight Dream is often most effective when it follows another form of crowd control or if you have another support to help you keep your team alive. Providing Malfurion with some much needed sustain without him relying on Regrowthing himself, Rejuvenation grants 5 health per ally with an active heal. It doesn't sound a lot, but considering Malfurion can comfortably maintain 4 Regrowths, 20 health a second is a significant amount of sustain. Vengeful Roots allows Malfurion to summon a Treant after casting Entangling Roots, that will then attack the nearest enemy. Not only does it provide another enemy for the opposing team to fight, but it works well to zone and absorb projectiles. Best of all, the Treant's damage increases every time you land Entangling Roots. Variable: Strangling Vines reduces the healing received by 30%, from anyone caught by his Entangling Roots. For bursting a single player down, Strangling Vines is ideal. Best chosen against healers such as Stukov, Uther or Rehgar. Hitting enemies with Moonfire with Wild Growth extends the duration of Regrowth (on all active Heroes) by 1 second. Considering Moonfire can hit many targets at once, especially in lane or during a team fight, it significantly elongates Regrowth and reduces your need to recast it. Having the ability to silence anyone around you for 3 seconds, while dealing high damage, is incredible. Whether you're being dived by a tank or assassin, Twilight Dream will instantly shut them down and allow your team to deal huge damage with reprisal. Against any melee composition, it's incredible. Variable: Tranquility is a great AOE heal that can comfortably keep a team alive thanks to the amount it heals but also the radius. Combined with Regrowth, most players can happily survive a spike. Just be aware that you can be interrupted while using it, as well as still being prone to crowd control. If you aren't against a dive heavy composition, it's a solid pick. Without Ice Block, Malfurion needs mobility. Nature's Swiftness grants him 6% movement speed with every active Rejuvenation, allowing him to comfortably reach 24% at late game (30% being with 5 active heals). It won't stop dive, but does allow you to reposition easily. Nature's Balance increases Regrowth's duration by 5 seconds, and increases the radius of Moonfire by 25%. It pretty much ensures you can not only keep Regrowth active on all Heroes at once (including yourself), but that your Moonfire will always land against a Hero (gaurenteeing the healing burst Moonfire provides). Variable: If your opposing team has a damage heavy player it's sometimes worth taking Ice Block. Gaining stasis for 3 seconds will save your life. Lifebloom provides some much needed additional sustain/burst for Malfurion, as Lifebloom instantly heals for 10% of a Heroes missing health. Variable: Astral Communian allows Malfurion to effectively teleport and cast Twilight Dream at his targeted location. Considering most Malfurion players did this with Blink + Twilight Dream, it's effectively a merging of two talents that allows for an instant teleport > silence. Best of all, Astral Communian increases the silence duration of Twilight Dream to 4 seconds. These Hero Threat Levels (1 being lowest threat and 10 being highest threat) are to help you determine which enemy Heroes can give you a headache. For the Heroes listed here, take extra care as they're particularly dangerous for Malfurion. Illidan: His mobility and evades make him a challenge for Malfurion. His damage and if he uses an Heoric will also leave you in trouble. If you miss your root, you're in real trouble. Nova: Nova loves to kill Malfurion. If you are not full health and you are alone, you are in jeopardy. Try to always stay near allies and keep your Entangling Root ready. Tyrael: Although his damage alone isn't amazing, it's the fact he can interrupt your tranquility which can cause you serious problems. If he does this, your team are going to pay for it. The Butcher: His charge, Lamb to the Slaughter or self heal can rip you up in seconds. Even if you root him, a good Butcher will have saved his Lamb to the Slaughter to ensure he can finish you off. Keep your distance! Valla: Her escape makes her tough to kill and her sustain damage can cause real problems, especially with the extended reach of Hunger Arrow. Fortunately she's squishy so if she gets caught in your Entagling Roots you can at least run away or poke her with Moonfire. This list of tips and tricks are just a handful of things we think will help your Malfurion play. We'll continue to add to the list as required and if you have any tips you'd like to share, let us know in the comments below and we'll place them here. 1. Regrowth heals over time. If it's active on someone, there's no value recasting it until the heal expires (or until you grab Life Bloom) - they won't heal for more. 2. If you want to burst heal, remeber that you need an active Regrowth and then hit an enemy Hero with Moonfire. 3. Try to always keep Regrowth active on your front-line Heroes, as they're the ones that'll take high damage. 4. Remember that Moonfire is your only burst heal, up to level 20. Don't just spam it. Use it to keep allies who are taking damage, topped up. 5. Moonfire is a valuable tool for scouting as it reveals enemies for 2 seconds. Use it on vents and bushes! 6. Entangling Roots will instantly root anyone hit by its center, when it's cast. Those on the edge will only be rooted when the roots reach their maximum distance. 7. You don't always have to use Entangling Roots just to lock a Hero down. Use it to zone enemies, tight spaces, or cover a squishy ally from being attacked. 8. Save Twilight Dream for when you're being dived, or when you can safely walk into the enemy team and detonate it. 9. Always hang back in a team fight. Your Moonfire has a good range, and Regrowth if your team are primed before a fight, lasts plenty of time for you to wait back.